The £3 million Caitlin Arctic Survey, to set off later this month, will be the first Arctic expedition to take regular radar measurements of the depth of the sea ice. It is hoped the results will give a definitive picture of how fast the ice caps are melting and how long it will take before they disappear altogether. Mr Hadow, who will lead the British expedition, has been traveling to the far north since the late 80s and was the first man to trek to the North Pole solo in 2003. 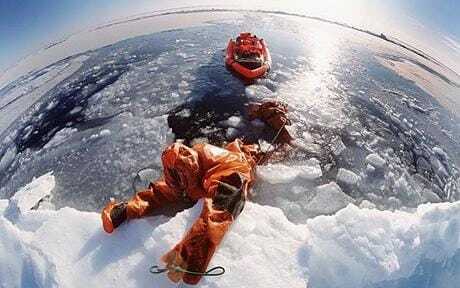 But he was expecting to have to swim across much more open water in the latest expedition because of climate change. "We will traveling on the sea ice across the Arctic Ocean for 1,500 hours. We estimate that up to 15 per cent of our time – over 150 hours – will be spent in the sea in immersion suits with polar boots and Arctic clothing underneath," he said. "That is not something I would have anticipated 20 years ago." Mr Hadow said the team were ready to cross waters of up to 1.2 miles (2km) while dragging their floating sledges behind.